We have seen before that disaster mitigation is the action or steps taken to reduce the impact of disasters. We may still remember about floods occurred in Jakarta-Indonesia in early 2013. 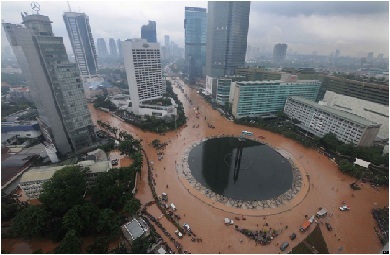 Water flooded into several Jakarta neighborhoods, even the city center and Presidential Palace complex. Torrential rain has caused West flood canal dike collapse and river overflowed. According to experts, flooding should not occur due to high rainfall intensity. Learned from this experience, the governor of DKI Jakarta has declared and committed to making a “breakthrough” in efforts to tackle the flooding. Actions and commitments which have been taken by the governor of DKI Jakarta called disaster mitigation or we can called as a prevention as well (the terms prevention and mitigation are sometimes used interchangeably in casual cases). From the above example with the amount of losses, we can see that the mitigation is essential to be done by all respective parties. Disaster mitigation measures maybe structural (for example: flood dike) and/or non-structural (for example: land use zoning). Disaster mitigation for floods includes building flood dikes, infiltration wells, revitalization of the drainage system, river normalization, etc. Disaster mitigation for landslides includes make a surface trench in the ground, concrete diaphragm walls, soil anchors, ground improvement, etc. Disaster mitigation for earthquake includes designing earthquake resistant structures, seismic evaluation of building and its component, improving earthquake resistance of existing buildings and infrastructure facilities, etc. Disaster mitigation for drought includes building dams and their associated reservoirs supply additional water in terms of drought, desalination of sea water for irrigation, building canals or redirecting rivers as attempt at irrigation in drought-prone areas. Disaster risks and/or hazard mapping. Enforcement of land use and zoning practices. Disasters mitigation public awareness programs. Developing national data on medical resources, etc.